Mormon Mommy Writers and Friends: Because Giveaways are SO Totally Cliche. 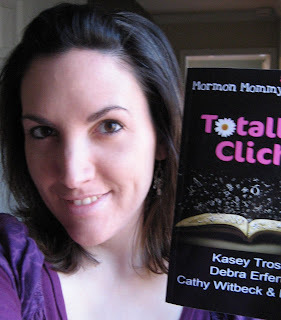 There's me with my very own paperback copy of Totally Cliche! Yes. A real live book. With my name on the cover. Awesomeness. It's the second-to-last day of January which means that it is my LAST day for a giveaway! And, well, not to brag or anything, but I happen to have written a book. Well, not a whole book. I wrote part of a book. Okay, not really, I just wrote a story and they put it in a book. :-) But it's a great book! And a fun story! So today I'm giving you a chance to win your very own ebook copy of Totally Cliche by ME and some other fabulous Mormon Mommy Writers! When I entered the Totally Cliche contest and my little fingers got to typing my little story (Alice in Clicheland) they got a tad bit carried away and wrote WAY more than they were supposed to. Way more than the 3500-word limit. Sooooo....I had to take out my writing shears and *snip* *snip* those words away. Poor little words. They looked so sad sitting there on my virtual cutting room floor. I just couldn't stand to see them that way. So I scooped them up and put them into a TOP SECRET FILE for only ONE LUCKY WINNER to see! That's right. You win not only the ebook, but BONUS text!! Cool, right? Winner will be posted in the Winner's Circle tomorrow morning. Be sure to check back and see if you've won! 1. It's so neat that you wrote anything that is published!! I'd love to read it!!! 2. I follow the MMW blog!!! 3. I follow MMW on Facebook!!! 4. I posted this on my facebook page!!! You can contact me at rmhulse78(AT)yahoo(DOT)com. I bought your book two weeks ago -- so fun to see your name officially in print. Your Alice cliche story is extremely clever and so fun to read. Thanks for sharing your ingenuity and talent with the rest of us.